During the Ming Dynasty (1368 – 1643 AD), China attempted to isolate itself from the world by rebuilding the Great Wall and a string of impregnable fortresses to protect China’s heartland from Mongol invasion. One of those fortresses was a new military city built near the ruins of Tang Chang’an, and the Ming named this city “Western Peace”—which in Chinese/Mandarin is “Xi’an”. Xi’an was one-sixth the size of Tang Chang’an, but nearly six hundred years later, its walls are still standing. Charles Higham said these walls are the most extraordinary, largest, best-preserved set of defensive walls in the world. The last segment of Neville Gishford’s Discovery Channel documentary introduced Zheng Canyang, the engineer responsible for preserving Xi’an’s walls, and Zheng explains how the walls would have been defended. History records that when the walls of this third city faced its first attack, they stood firm, but the attack did not come during the Ming or Qing Dynasties. The attack came five hundred years later from April to November 1926. As China bled from the Civil War between warlords, the CCP and the KMT, a powerful Chinese general by the name of Liu Zhenhua attacked Xi’an with a large army and modern artillery. However, the 20th century artillery rounds only dented the walls, and after months, Xi’an’s walls still stood and Liu Zhenhua’s army retreated. The siege was part of an anti-Guominjun campaign lasting from late 1925 to early 1927, which raged across North China and had nothing to do with the civil war between CCP and KMT, explaining why this military campaign received no coverage in the popular media or academic circles. The newest enemy to Xi’an’s ancient walls comes from modernization and the millions of inhabitants of the city. As the water table below the city is sucked dry from so many people, this has caused the earth to sink, which is pulling down the walls, and engineers and scientists are working to discover ways to save them. This link to Xi’an will take you to the photo page on my Website for our trip there in 2008. Although Christianity and Islam were both introduced to China during the Tang Dynasty, Buddhism has deeper roots in the culture since it first arrived in China from India about 200 BC. Christianity arrived in China more than eight centuries after Buddhism and only a decade before Islam when a Nestorian monk named Aluoben entered the ancient capital city of Tang Chang’an in 635 AD. In addition, in 629 AD, the Buddhist monk Xuanzang left Chang’an against the emperor’s orders to travel the world in search of enlightenment. He went west toward India along the Silk Road with a goal to find original Buddhist scriptures. He traveled 10,000 miles over three of the highest mountain ranges in Asia and was gone 16 years. When Xuanzang returned in 645 AD, he had 1,300 scrolls of Buddhist Sutras, and requested the building of a pagoda, which became the Giant Wild Goose Pagoda—nearly 65 meters tall (more than 213 feet). It was made of rammed earth, and the pagoda would collapse more than once and be rebuilt. No one knows exactly how the Tang Dynasty engineers managed to build a structure that tall of rammed earth. Neville Gishford’s Discovery Channel documentary revealed the answer to a mystery when a hidden crypt beneath the Giant Wild Goose Pagoda was discovered using ground based radar. When The Tang Dynasty collapsed due to rebellion, the city was destroyed, but the Giant Wild Goose Pagoda was left untouched. Gishford revealed that even though Tang Chang’an was destroyed, the city was copied throughout Asia and one city in Japan, Kyoto (formally the imperial capital of Japan – 794 to 1869 AD), was a scaled replica of Tang Chang’an. In fact, in 1974, the modern city of Xi’an and Kyoto formally established a sister-city relationship. However, this was not the end of Chang’an. It would be rebuilt a third time but with a different name, Xi’an. In 1368, nearly five hundred years after the fall of the Tang Dynasty, the Ming Dynasty (1368 – 1643 AD) would rebuild the Great Wall in addition to the third city called Xi’an as a defense against the Mongols that had conquered and ruled China during the Yuan Dynasty (1277 – 1367 AD). From the Qin Dynasty (221 – 206 BC) to the Tang Dynasty (618 – 907 AD), 62 emperors ruled China from Qin Xianyang and Han Chang’an. The China Daily reported that there are about 500 burial mounds where the remains of emperors and aristocrats rest. The largest tombs mark the resting place of Emperors Qin Shi Huangdi (259 – 210 BC), Tang Gaozong (628 – 683 AD), and his wife Empress Tang Wu Zetian (624 – 705 AD). 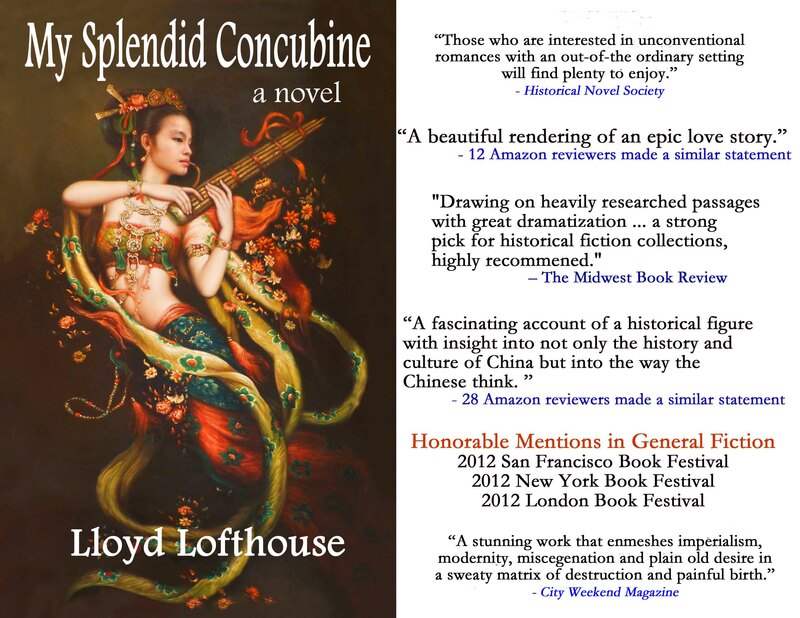 When I mentioned Neville Gishford’s documentary, China’s Most Honourable City, in Part 2, Chang’an was the capital of the Tang Dynasty with a population of over a million — six times the size of ancient Rome. The Daming Palace, where the Tang Emperors ruled China, was 800 years older and nearly five times larger than Beijing’s Forbidden City, and this huge palace was built in one year. 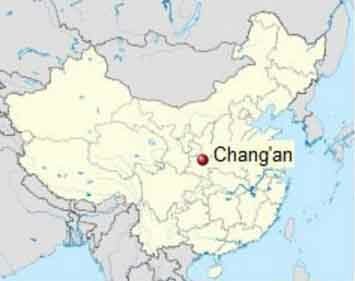 However, it wasn’t the Daming Palace that made Chang’an powerful. Long before Manhattan, Hong Kong, Paris and Dubai, Chang’an was where the world came to shop. Over a thousand years ago, the wealth of the West poured into China and arrived at Chang’an over the Silk Road. But wealth wasn’t the only thing China gained. Major religions also arrived in China at this time. Chang’an and Xi’an have a Muslim history going back thirteen hundred years when Islam was first introduced to China in 650 AD. In Part One, I mentioned the subway system under construction in modern Xi’an. That was in September 2008. When the second phase is completed, the full length of Line 2 will be 26.64 kilometers (about 16.5 miles). The population of Xi’an has also increased since Neville Gishford hosted The Discovery Channel’s documentary of China’s Most Honourable City. Today, there are more than 8 million people living there. Gishford’s documentary started with Archaeologist Charles Higham (born 1939), a world famous authority on ancient Asian cities. Higham is a British archaeologist most noted for his work in Southeast Asia. Among his noted contributions to archaeology are his work (including several documentaries) about the Angkor civilization in Cambodia, and his current work in Northeast Thailand. He is a Research Professor at the University of Otago in Dunedin, New Zealand. More than two thousand years ago, the walls of Chang’an were made of rammed (compressed) earth and much of the city from kiln fired clay bricks, which was a revolutionary building material at the time that changed the history of architecture. The builders of Han Chang’an used this new technology in revolutionary ways. For instance, building an underground sewer system connected to the moat that surrounded the city. Most people outside of China only know of Beijing—first known as Peking—as the capital of China. However, another city was China’s capital for more than a thousand years, and more than 4,000 historical sites and tombs have been excavated there. That city was Chang’an and it served as the capital of China from the Han to the Tang Dynasty spanning more than eleven hundred years. It was also the cultural center of the Silk Road. In 2008, the last time we visited Xi’an (near the original site of Chang-an), subway construction was running behind schedule due to a law that does not allow the destruction of historical sites such as the tombs of emperors. There are so many of these tombs below ground that the subway tunnels must be diverted to avoid them causing construction delays. This is the first part of a documentary about Xian produced by the Discovery Channel. I watched the five-part series on You Tube in 2011 but only found Part 1 to share with this series of Blog post. To learn about Chang’an and Xi’an’s also teaches us a lot about China’s civilization. 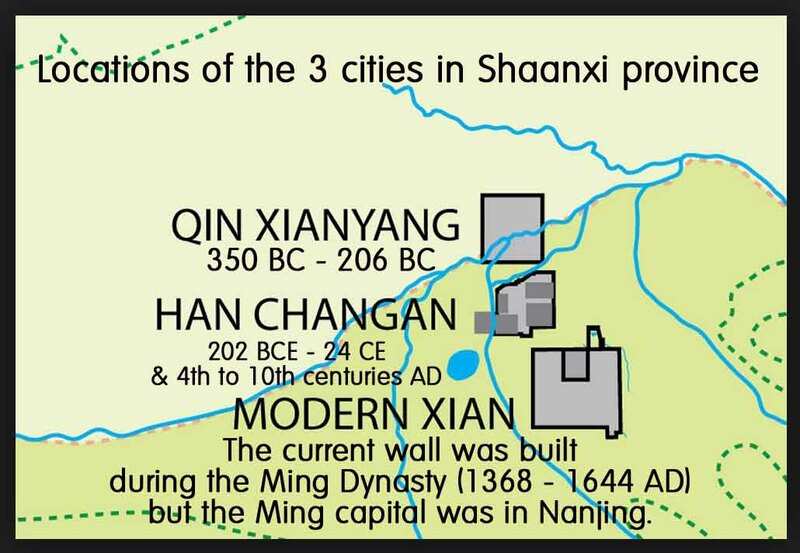 The city of Han Chang’an was larger than Constantinople and richer than Egypt’s Alexandria. Today, another city called Xi’an, near the original location of Chang’an, is home to millions of people and thousands of men made of clay, the Terra Cotta Warriors guarding China’s first emperor. Soon after the Qin Dynasty capital of Xianyang was destroyed, the Han Dynasty built the second city Chang’an, which is close to the modern city of Xi’an, and the old eroding walls of Chang’an are still visible. Covering 36 square kilometers, Han Chang’an (202 BCE – 24 CE and again in the 4th to 10th centuries AD) was more than one and a half times the size of Rome. This two-part post may come as a surprise to many in the West that think there is no religious freedom in China. Xian claims it has a Muslim history going back more than thirteen hundred years when Islam was first introduced to China in 650 AD.